Maximizing ROI on system implementations is always the primary goal in any economic environment. System implementations ought to follow a framework that executes and manages the process in an efficient and effective manner that ensures ROI from the capital investment. Measurement of ROI is determined based on the stated objectives during the planning phase of the proposed system implementation. Implementing a value adding system is predicated on adopting the right methodology to ensure that the new solution addresses the organization’s strategic objectives and develops metrics that correlate to the strategic objectives in order to measure the initial ROI and the projected long-term benefits of the new solution. The following implementation methodology offers guidance that should be part of any IT project implementation to ensure that the implementation will meet expectations in terms of goals and objectives, ROI and timely project completion within budget constraints. Firstly, establishing the right team during the planning phase of the project is critical to the overall success of the project. The executive team needs to be an advocate of the project offering executive direction and support so to send a clear message to the organization that the implementation is supported by executive management and is viewed as critical to the overall success and going concern of the organization. In addition, the project team needs to be a comprehensive team composed of technical staff with a clear understanding of the technology and solution being implemented and line of business managers directly affected by the new solution. Business managers will provide operational direction in defining business processes, requirements and progress feedback during the course of the implementation as well as function as project advocates at the intended user community level. Following the project team setup is defining the business goals of the project. These goals are paramount to the success of the implementation. Defining business goals are always unique and specific to individual organizations. However, all projects should have a component of improving operational efficiencies including streamlining workflow and automating processes as reasonably possible. Making operations more efficient gives employees the opportunity to engage in other productive areas of the business as the previously encumbered time becomes available. New systems, at their very core, should offer more insightful information for making intelligent business decisions. A new system that does not offer access to useful and relevant information is an initiative that should not be undertaken. Depending on the type of solution, the new system should improve collaboration with customers, suppliers or among employees. Whether the new system is a custom application or a prepackaged solution, the next step in the methodology is having a clear understanding of the application as it relates to custom development or the prepackaged software’s capabilities. Not having a comprehensive understanding of the application could have repercussions throughout the implementation if it’s assumed that the software has the expected capabilities when in fact it doesn’t. To be clear, knowing all of the functionality and nuances of the application is not necessarily realistic or practical. However, gaining as much understanding of the application’s functionality is critical. To ensure against requirement gaps and to control scope creep the project methodology needs to have procedures in place to address such situations. In conjunction with the understanding of the application’s functionality is clearly defining the business processes to improve. Defined processes to improve are the roadmap of the project and are the guiding force for implementation success. Clearly documenting and communicating the processes to improve and the overall business goals to all stakeholders of the project will ensure all stakeholders will actively monitor and measure the progression of the project. Once the project team, business goals, intended software to be implemented, and the specific processes to improve have all been identified; the next step is to determine the method of deployment. The question of whether to implement the solution internally on the organization’s infrastructure or consider subscribing to a software as a service (i.e. SaaS) solution is largely predicated upon the business requirements. As cloud computing increasingly becomes a viable alternative to owning, maintaining and administering systems internally; subscribing to a SaaS solution offers a cost-effective and minimal administration approach that should be taken into consideration as a matter of due diligence. 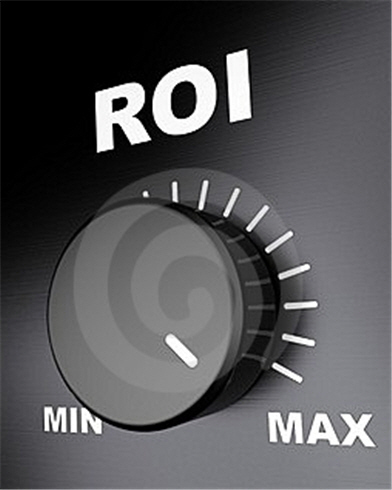 The final step is to define the measures that put ROI in real terms. Specifically, developing a list of key performance indicators (i.e. KPIs) that identify the quantitative and qualitative impact of the new solution to determine and measure the success of the project. The actual KPI’s should come from the business units, departments and individuals impacted by the project as they are the ones that have clearly defined metrics in place that are used during their normal course of business. As such, the business units or functional areas could effectively develop a list of appropriate project measures. Defining quantitative measures is typically easier to identify such as sales volume measures, average order to cash time, cash collection measures and changes in labor productivity. However, qualitative measures are often less obvious as they are not tied to numeric measurements. Qualitative measures can be defined as better decision making, improved customer service satisfaction, less processing errors and overall improved working conditions. It is reasonable to expect that the KPI’s will need to be adjusted and assumptions changed as new information becomes available. Having flexibility in changing KPI’s will ensure that measures are practical and realistic to the project. In addition, using industry standard KPI’s will help to benchmark your results to your competitors from a competitive advantage perspective. After the new solution has been implemented and in use, organizations need to constantly innovate the system with new processes in order to derive more cost reduction and productivity improvements. As a general rule, opportunities for improvement are a function of time. Rare is the case where established business processes remain constant in the face of an ever changing commerce environment. As methods of conducting business evolve the need to “reinvent” policies and procedures become evident and necessary. Implementing a new system whether the system is an enterprise wide mission critical solution or a functional requirement for a department, will have greater propensity for success and long term value when proven implementation methodology is adopted and enforced. Aligning IT to the Business	Hello… Can I Listen to You?